The god Anansi is dead. Now its upto 'Fat Charlie' his only son, to fill the gap of 22 years of no contact and mourn. But 'Fat Charli' is not alone in the mourning. He has a brother, who enters his life to turn it upside down. Anothe Neil Gaiman book. Another 'bizarre meets a normal guy's life' plot. How uncanny the book could be right ? With these thoughts in my head, I picked up the book. To my surprise and delight, despite a cliched, contrived plot, Neil Gaiman gives you a riot and a fun fest. The book is so quirky and fast paced, that it never bores you. It keeps on surprising you with its genius subplots. So before I overdo it with my praises, let me explain the plot to you. 'Fat Charlie Nancy' has grown apart from his father Anansi (Nancy from Anansi!) because of his embarrassing ways (who was a god in his life). Upon hearing of his death, Fat Charlie's fiancee (an eternal do-gooder) forces him to make his peace. On his trip to Florida, for the last rites ceremony, he learns that his dad was a god and he has a brother, called Spider. Of course like a normal human being Fat Charlie does not believe in such absurd revelations. Through some turn of events, Spider comes to meet Fat Charlie. Not only does he bring along chaos, he totally disrupts the order of life for poor Charlie. Charlie then sets out to straighten his life. As expected he does something so wrong that now everyone must face the consequences. The 2 brothers despite the differences set out to make it all right and pay an homage to their father. This book, strengthened my belief in the story-telling being more important than the story itself. 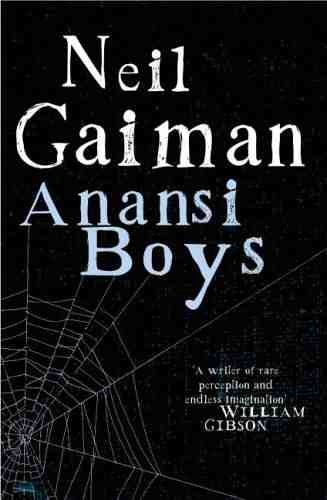 Mr. Gaiman brings us Anansi, the spider god, who is full of mirth, mischief, but never any bad intentions. The book creates that vibe. You do not feel morose even in some particularly bad situations the characters are in. In fact you look forward to everything coming along brightly. I think that is a story telling #win. Not just that I loved how a really quirky carribbean folk god has been brought to life and also how the story follows the monomyth. Also, literature wise, I love how words just flow for Neil Gaiman. Not sure if this is great literature or not, but the book is so inventive, it does not disappoint. It doesn't fail in any department - characters and character development, plots, subplots, tying the loose ends, and most importantly FUN. I am feeling unusually cheerful and full of life (despite being overloaded at work). That is what Anansi (or any god?) does to your mood, I think ? All in all a total mad-gab-riot-fun book! I've immense respect for this guy. He has always been on my 'to-read' list, but am unable to due to previous commitments. But one day, I will read all his works, starting with American Gods.